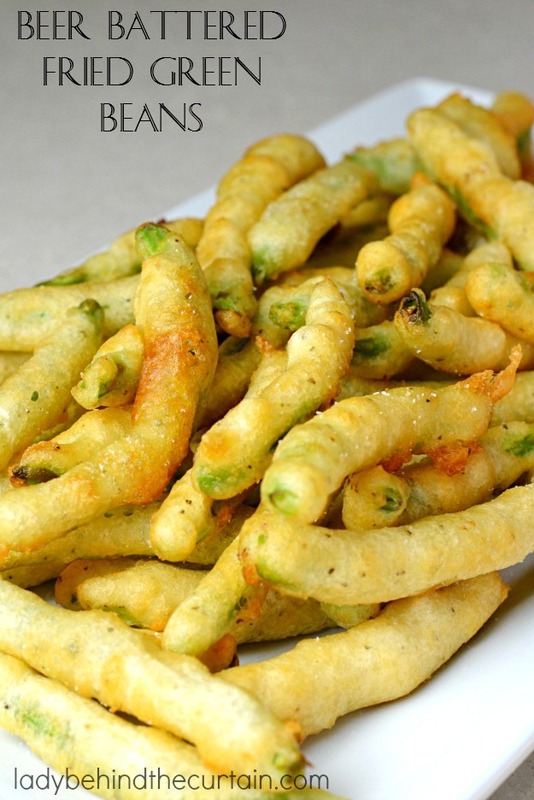 Beer Batter Fried Green Beans: Tender fresh green beans dipped in a beer batter and fried to perfection. Simply clean the fresh green beans my snapping off the ends, give them a rinse, blanch, dip and fry. So simple and so rewarding. Especially at the end of the green bean season when you think you can’t look at another green bean again! This batter would work perfectly on zucchini too! Add cleaned green beans to a medium saucepan; cover with cold water. On high heat cover and bring to a boil; still covered boil for 2 minutes. Fill a medium bowl with ice water; drain green beans and place in the prepared ice water. Soak until green beans are completely cold; drain and set aside. Prepare the batter by adding the beer, flour, salt and pepper to a medium bowl. Heat about 2 inches of oil in a deep pot to 360 to 370 degrees. 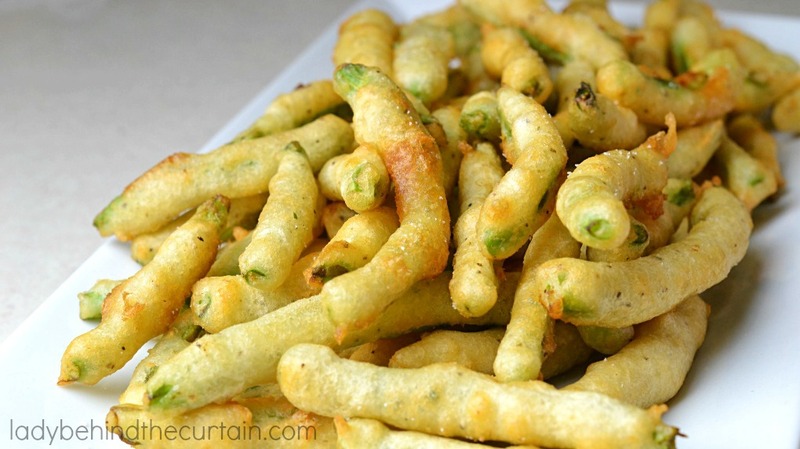 Dip green beans one at a time in prepared batter and place in hot oil. Fry until golden brown (about 2 minutes). Place of prepared cooling rack and if desired sprinkle hot green beans with salt. NOTE: Do not crowd the green beans while frying. Dip another batch of green beans in batter and fry. While that batch is frying transfer the batch of fried green beans from the cooling rack to a serving platter. TIP: To keep the green beans warm; place them in a warm oven on the warm setting. Once the second batch is done, place it on the prepared cooling rack and sprinkle with salt. Keep up this routine until all the green beans have been fried. I love green beans. We grow about 150 acres of them here on our farm each year. I will definitely have to try this recipe. Yum! I love that idea Kris. Hi! I wonder if you could freeze these after batter dipping and possibly cook in the air fryer later? 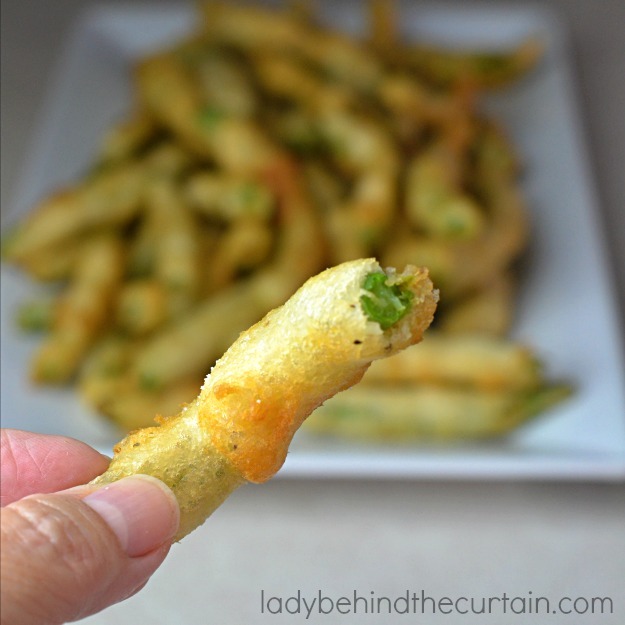 Love my air fryer and my green bean fries. I think I will try it! That’s a great idea Pamela. I think it would work. I would lay the green beans on a cookie sheet lined with parchment paper, spread apart. Freeze them and then add them to a freezer safe zip to bag.